One of the more impressive stops along the one of the oldest trade routes in the world, the Agzikarahan Kerevansarayi is found on the Uzun Yol (Long Road), which used to connect Konya to various other cities and stretched all the way to Persia. 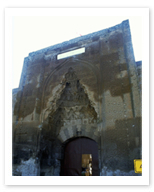 The caravanserai, or han, is an architectural form closely associated with the Selcuks. These structures were built to encourage trade along the routes, and to provide for the safety of travellers, a purpose that they served remarkably well. Even today if you travel long distances by land across the Anatolian countryside, you’ll see structures like this one, which pop up as welcoming eye-catchers along otherwise long, barren stretches of road.